"This is a recipe the whole family loves. It's always a hit!" Preheat the oven to 350 degrees F (175 degrees C). Grease and flour a 10-inch Bundt pan or 9-inch tube pan. 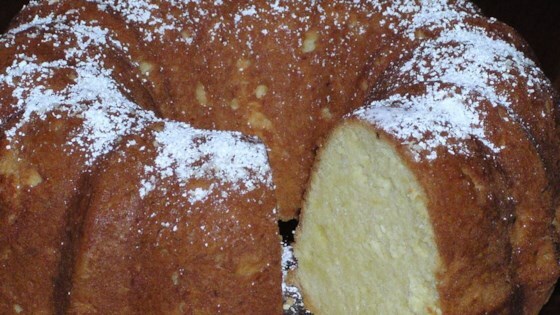 Beat the butter and sugar with an electric mixer in a large bowl until light and fluffy. The mixture should be noticeably lighter in color. Add the room-temperature eggs one at a time, allowing each egg to blend into the butter mixture before adding the next. Beat in the vanilla with the last egg. Pour the flour mixture into the bowl alternately with the sour cream, mixing until just incorporated. Transfer the batter into the prepared pan and spread it smooth. Bake in the preheated oven until a toothpick inserted in the cake comes out clean, about 1 hour and 20 minutes. Cool for at least 10 minutes before inverting pan onto a cooling rack, and tapping out the cake. Dust with confectioners' sugar before serving.